To set the stage for my analysis of contemporary data, this chapter first draws a historical sketch of the identity creating factors ‘Spain,’ ‘Yugoslavia’ and ‘Israel.’ Further, this chapter contains narratives of Sarajevo Sephardim in regards to belonging to ‘Spain,’ ‘Yugoslavia’ and ‘Israel.’ Questions I ask my interviewees include whether they think someone will speak Judeo-Spanish in Sarajevo in a couple of years. If they consider Hebrew and Israel to be important and whether or not they support Israel in football matches when Bosnia and Herzegovina or Spain is playing against Israel. Moreover, I ask if they have lived in Israel and, if so, if they wish to return there. 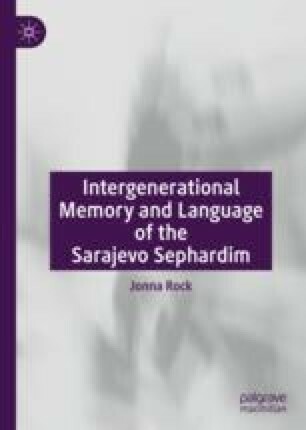 As regards Yugoslavia, the chapter explores which language the Sephardi Jews opted for after the Yugoslav experiment collapsed in the 1990s. Baer, A., & López, P. (2015, September 13). Antisemitismo sin antisemitas. El País. Retrieved October 6, 2016, from http://politica.elpais.com/politica/2015/09/08/actualidad/144170-7339_106016.html. Borgestede, M., & Müller, U. (2014, November 2). Gerechtigkeit für sephardische Juden. Die Welt. Retrieved September 23, 2015, from http://www.welt.de/politik/ausland/article124761088-/Gerec-htigkeit-fuer-sepha-rdisc-he-Juden.-html. Ellingwood, K. (2004, June 15). Can Ladino Be Saved? Jerusalem Post. Retrieved December 4, 2015, from http://www.highbeam.com/doc/1P1-95524954.html. Freund, M. (2013, April 11). David Albala: Serbian Warrior, Zionist Hero. Jerusalem Post. Retrieved January 6, 2017, from http://www.jpost.com/Opinion/Columnists/David-Albala-Serbian-warrior-Zionist-hero-330619. Goldstein, I. (1999). The Jews in Yugoslavia 1918–1941: Antisemitism and the Struggle for Equality. Jewish Studies at the Central European University, 2. Retrieved January 25, 2017, from http://web.ceu.hu/-jewishstudies/pdf/02_goldstein.pdf. Halon, E. (2017, August 4). Spain to Boost Protection of ‘Severely Endangered’ Ladino Language. Jerusalem Post. Retrieved August 4, 2017, from http://www.jpost.com/-Diaspora/Spain-to-boost-protection-of-severely-endangered-Ladino-language-501307. Herschthal, E. (2010, June 29). Israel’s Black Panthers Remembered. The New York Jewish Week. Retrieved March 22, 2017, from http://jewishweek.timesofisrael.com/israels-black-panthers-remembered/. HumHAG. (1991). Das Kontigentflüchtungsgesetz, (Gesetz über Maßnahmen für im Rahmen humanitärer Hilfsaktionen aufgenommene Flüchtlinge). Retrieved April 12, 2014, from http://www.aufenthaltstitel.de/humhag.html. Jakubowski, J. (2015, August 27). Därför är Spaniens judar i dag välkomna tillbaka. Dagens Nyheter. Retrieved October 27, 2015, from http://www.dn.se/kultur-noje/darfor-ar-spaniens-judar-i-dag-valkomna-tillbaka/. Jones, S. (2016, December 31). Brexit Vote Sparks Rush of British Jews Seeking Portuguese Passports. The Guardian. Retrieved June 20, 2017, from https://www.theguardian.com/world/2016/dec/31/brexit-vote-rush-british-jews-portuguese-passports. Jones, S. (2017, July 1). Spain Honours Ladino Language of Jewish Exiles. The Guardian. Retrieved August 1, 2017, from https://www.theguardian.com/world/2017/aug/01/spain-honours-ladino-language-of-jewish-exiles?CMP=share_btn_link. JZ: Jüdische Zuwanderer. (2007). BAMF. Retrieved March 25, 2014, from http://ec.europa.eu/ewsi/UDRW/imag-es/ite%2D%2Dms/docl_1372_328413896.pdf. Lewis, P. (1991, December 17). U.N. Repeals Its ’75 Resolution Equating Zionism With Racism. The New York Times. Retrieved June 4, 2018, from https://www.nytimes.com/1991/12/17/world/un-repeals-its-75-resoluti-on-equating-zionism-with-racism.html. Maltz, J. (2018, July 30). Thousands Attend Mega Arabic Lesson in Tel Aviv to Protest Nation-state Law. Haaretz. Retrieved July 31, 2018, from https://www.haaretz.com/israel-news/.premium-several-thousand-protesters-attend-mega-arabic-lesson-in-tel-aviv-1.6334735. Minder, R. (2015, June 11). Spain Approves Citizenship Path for Sephardic Jews. The New York Times. Retrieved September 23, 2015, from http://www.nytimes.com/2015/06/12/world/-europe/spain-approves-citizenship-path-for-sephardic-jews.html?_r=0. Paz, F. (2018, December 3). Mayor plazo de nacionalización: Sefardíes, Judios que ‘pueden regresar’ a Espana. eSefarad.com. Retrieved March 16, 2018, from http://esefarad.com/?p=82205. Saban, B. (1999, September 17). New Life for Ladino. Jerusalem Post. Retrieved April 12, 2015, from http://www.highbeam.com/-doc/1P1-23703385.html. Schuessler, R. (2015, April 26). Born Again: Jews of Sarajevo Welcome Baby Boom. Aljazeera America. Retrieved July 27, 2017, from http://america.aljazeera.com/articles-/2015/4/26/jews-sarajevo-baby-boom.htm-l.